A unit of time; the period between one new moon and another. According to the account of Creation in Genesis, it was decreed that the "lesser light" should "rule the night" and serve "for signs and for seasons" (Gen. i. 14). The Psalmist also says, "He appointed the moon for seasons" (Ps. civ. 19). In round numbers thirty days constituted a month, as is evident from the Flood narrative, counting 150 days for five months from the 17th of the second to the 17th of the seventh month (Gen. vii. 11, 24; viii. 4); and the mourning period, reckoned as a full month in Deut. xxi. 13, is elsewhere fixed at thirty days. That twelve months constituted a year also is evident from the Flood narrative (Gen. viii. 5-13). 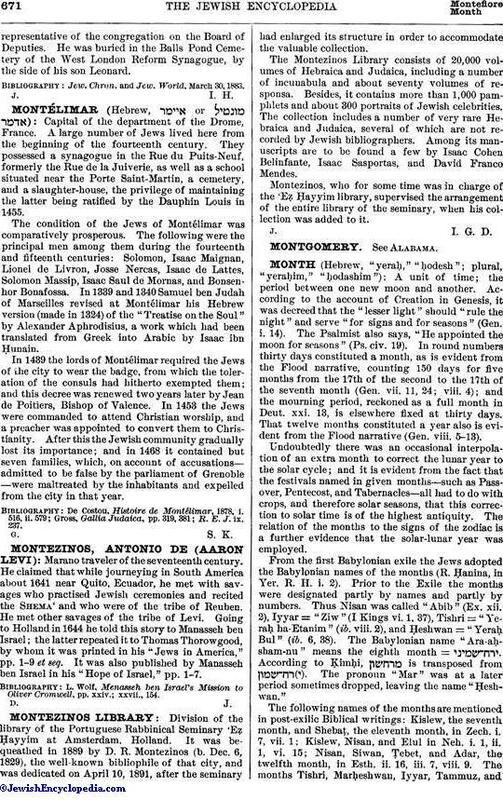 Undoubtedly there was an occasional interpolation of an extra month to correct the lunar year to the solar cycle; and it is evident from the fact that the festivals named in given months—such as Passover, Pentecost, and Tabernacles—all had to do with crops, and therefore solar seasons, that this correction to solar time is of the highest antiquity. The relation of the months to the signs of the zodiac is a further evidence that the solar-lunar year was employed. From the first Babylonian exile the Jews adopted the Babylonian names of the months (R. Ḥanina, in Yer. R. H. i. 2). 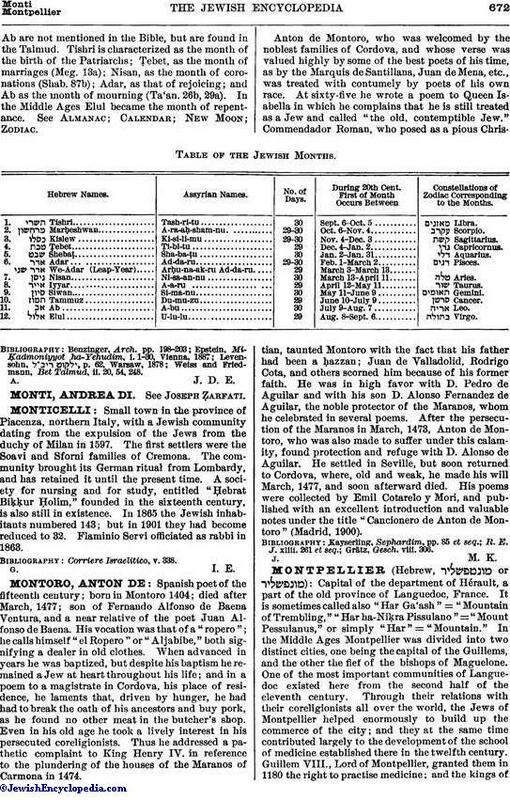 Prior to the Exile the months were designated partly by names and partly by numbers. Thus Nisan was called "Abib" (Ex. xii. 2), Iyyar = "Ziw" (I Kings vi. 1, 37), Tishri = "Yeraḥ ha-Etanim" (ib. viii. 2), and Ḥeshwan = "Yeraḥ Bul" (ib. 6, 38). The Babylonian name "Ara-aḥsham-nu" means the eighth month = . According to Ḳimḥi, is transposed from ). The pronoun "Mar" was at a later period sometimes dropped, leaving the name "Ḥeshwan." The following names of the months are mentioned in post-exilic Biblical writings: Kislew, the seventh month, and Shebaṭ, the eleventh month, in Zech. i. 7, vii. 1; Kislew, Nisan, and Elul in Neh. i. 1, ii. 1, vi. 15; Nisan, Siwan, Ṭebet, and Adar, the twelfth month, in Esth. ii. 16, iii. 7, viii. 9. The months Tishri, Marḥeshwan, Iyyar, Tammuz, andAb are not mentioned in the Bible, but are found in the Talmud. Tishri is characterized as the month of the birth of the Patriarchs; Ṭebet, as the month of marriages (Meg. 13a); Nisan, as the month of coronations (Shab. 87b); Adar, as that of rejoicing; and Ab as the month of mourning (Ta'an. 26b, 29a). In the Middle Ages Elul became the month of repentance. See Almanac; Calendar; New Moon; Zodiac. Weiss and Friedmann, Bet Talmud, ii. 20, 54, 248.